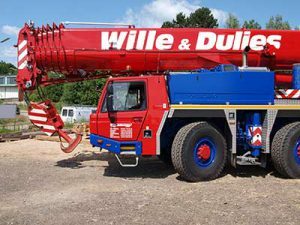 Since 1999 Wille & Dulies Krane GmbH has been a well-known name for crane works, heavy loads, and special transports as well as logistics in northern Germany and Denmark. After starting small, we now have a large logistical network with our locations in Schleswig-Holstein allowing us the successful implementation of construction site and industrial assemblies as well as the transport of heavy loads. Smooth processes, reliable work, and timely execution will help you to save time and money. To guarantee this we work professionally, quickly and flexibly. 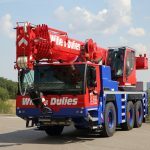 The size of our fleet allows for us to perfectly adapt the cranes to the respective project and, if necessary, to utilise them on short notice. 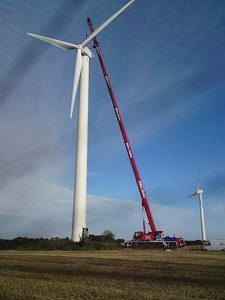 Our mobile telescopic cranes meet the latest technical requirements. With the loading capacities ranging from 30 to 350 tonnes, we are able to cover a wide range of applications such as industrial, tower crane, and construction site assemblies as well as rescue work. Before placing your order, we are happy to visit your site and provide personal advice in order to plan precisely. With our large fleet, we are equipped for any kind of heavy load or special transport up to a payload of 60 t.
This also includes the transport of the entire machine park during company relocations. We have the necessary loading techniques as well as trained drivers. Our dedicated team also takes on the entire logistics for you – from the timely planning and coordination of the vehicle requirements, through route planning and the obtaining of transport permits. Our disposition, equipped with modern EDP systems, ensures exact service allocation and reliable scheduling. Our dedicated logistics team ensures the right use of the vehicle and coordinates projects and trips from start to finish. Some of the our most interesting projects, from the planning point of view as well as the execution, were the dismantling of the 90 m high chimney at Flensburg’s public utility company “Stadtwerke” in the Nikolaiallee; the lift of an air-conditioning system to the roof of the “Flensburg Galerie” and the assembly of the rooftop of the exhibition hall in Husum, where 6 cranes were needed at the same time. Automotive service “KFZ-Service Großenwiehe” carries out maintenance and repair works quickly and effortlessly. Since 1999, our successful business makes us an experienced specialist beyond the standard. Our long-time, well-trained employees also master unusual orders. Our team consists of 25 employees and is capable of almost every challenge. Our name guarantees a solid execution of all orders. Since 2007 we have been certified according to ISO 9001: 2008. Since 2017 we have also been certified with SCC. We are available for your convenience 24 hours a day and we will be on the spot in no time should you need us.